At BigML we take advantage of many fantastic open source libraries produced by the Clojure community. We want to do our bit as well, so we’re happy to announce a Clojure library for random sampling. Perhaps random sampling isn’t the sexiest of topics, but it is a fundamental tool for machine learning and, more generally, statistics. At its core the problem is simple; select N items from M items. As with many subjects, however, the devil is in the details. Do you want to sample with replacement or without replacement? Do you need to seed the sample for repeatable results? Do you need to weight the items so some are more likely to be sampled? Can you fit the original population or the resulting sample in memory? Our library tries to offer solutions no matter how you answer those questions. For example, depending on your memory situation the library offers three implementations of random sampling (each with its own namespace): simple sampling, reservoir sampling, and stream sampling. Simple sampling is the best option if your data is small enough to comfortably keep in memory. If that’s not true but the sample you want to take is small, then reservoir sampling is a good choice. If neither the original population nor the sample can reside in memory, then stream sampling is appropriate. To show off a few of the features, we’ll fire up the REPL and walk through some examples. First we’ll explore simple sampling. It keeps the original population in memory and returns a lazy sequence of samples. By default the sample is without replacement, so it’s equivalent to a lazy Fisher-Yates shuffle. Setting the replace parameter as true will sample with replacement. Since there is no limit to the number of items that may be taken with replacement from a population, the result will be an infinite length list. So make sure to take however many samples you need. A sample may be weighted using the weigh parameter. When given a function that takes an item and produces a non-negative weight, then the resulting sample will be weighted accordingly. By default, every call to simple/sample will result in a new sample order. If you need a sample to be reproducible, just set the seed parameter to any hashable value. Reservoir sampling keeps the sample in memory (hence the ‘reservoir’). However, the original population is streamed through the reservoir so we don’t need to worry about the population size. This makes reservoirs useful when the original population is too large to fit into memory or the overall size of the population is unknown. To create a sample reservoir, use reservoir/create and give it the number of samples you desire. The resulting reservoir acts as a collection, so you can simply conj values into it to build a sample. A collection can also be passed through a reservoir with into. Alternatively, reservoir/sample accepts the original population and a reservoir size and returns the final reservoir. Like simple sampling, reservoirs support the seed, replace, and weight parameters. Thanks goes out to this blog post and this paper for tips on weighted reservoir sampling. Stream sampling is useful when taking a large sample from a large population. Neither the original population nor the resulting sample are kept in memory. There are a couple of caveats. 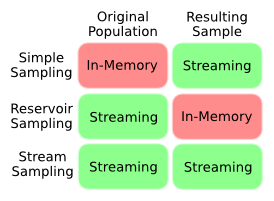 First, unlike the other sampling techniques, the resulting sample stream will not be in random order but in the order of the original population. So if you need a random ordering, you’ll want to shuffle the sample. The second caveat is that, unlike reservoir sampling, the size of the population must be declared up-front. To use stream sampling, call stream/sample with the population, the desired number of samples, and the size of the population. The result is a lazy sequence of samples. As with the other sampling techniques, stream sampling supports replace and seed. If an item isn’t selected as part of a sampling, it’s called out-of-bag. Setting the out-of-bag parameter to true will return a sequence of the out-of-bag items instead of the sampled items. When paired with seed, this can be handy for partitioning a population. Stream sampling does not support weighted samples, however the stream/cond-sample function provides a way to fine tune a sample. cond-sample accepts a population followed by pairs of clauses and sample definitions. A clause should be a function that accepts an item and returns either true of false. Following each clause should be a sample definition that describes the sampling behavior when the condition is true. We’ve left out a few details such as stream/multi-sample, stream/multi-reduce, reservoir implementation options, and the configurable random number generator (Marsenne twister or linear congruential). But we don’t want to spoil all the mystery of the official documentation. Nonetheless, you should now have a pretty good idea what the library offers. We hope you’ll find it useful. As always, please feel free to give us feedback and to pitch in with your own contributions!